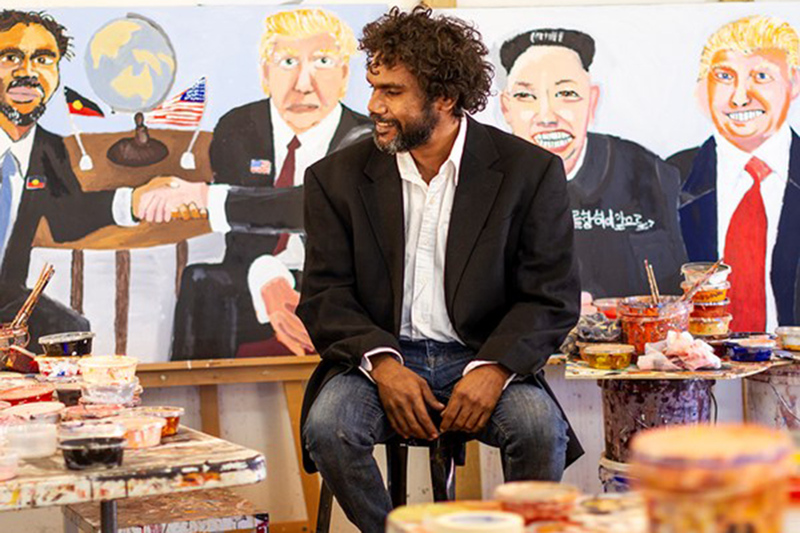 Vincent Namatjira relishes painting famous people who are humorously redeployed across vivid canvases and depicted in his community in remote Indulkana in South Australia. His powerful paintings are part portraiture and part caricature, in which politicians are placed side by side in wryly preposterous juxtapositions, such as Donald Trump and Kim Jong-un grimacing together in Donald and Kim (2017). Namatjira often inserts himself into his mischievous compositions, as is the case in Vincent & Donald (The Handshake) (2018), in which the artist is depicted shaking Trump’s hand in an impossible gesture of allegiance. By conflating unlikely figures, including Queen Elizabeth holding a teacup emblazoned with the Union Jack alongside Trump clutching a McDonald’s bag (Queen Elizabeth & Donald, 2018), Namatjira wittily highlights the politics of history, power, and leadership from a contemporary Indigenous perspective. Namatjira has developed a signature style with political potency, often inserting himself within his mischievous compositions.